When lighting strikes, electrons shoot screamingly fast between clouds and Earth's surface (or between two clouds). But the particles don't travel through empty space. Along the way, they crash again and again into atmospheric gas molecules. All those collisions heat the gas into a state called plasma, which glows with blackbody radiation (a type of electromagnetic radiation given off by some opaque objects). Some of that glow, people can see, in the characteristic bright flash of lightning. But some of the emission takes place at frequencies, including X-rays and gamma-rays, far above what the human eye can detect. Enoto's results show that those beams of invisible energy — especially the gamma-rays — excite ambient nitrogen and oxygen in the atmosphere, knocking out neutrons from the molecules the gamma rays encounter. In other words, the process results in nuclear fission. Now, things get really exciting. Nitrogen nuclei with 14 neutrons are stable. But take one of those neutrons away, and you're left with nitrogen-13, an unstable, radioactive isotope. Similarly, oxygen-16 is stable, but -15 … not so much. Soon, all of those N-13 and O-15 molecules decay. Each unstable isotope fires off an additional neutrino and positron (the antimatter partner of the electron); both are elementary particles with exotic properties. The neutrinos stream away, nearly undetectable. But the positrons, or anti-electrons, go on to collide with their twins: ambient electrons in the atmosphere. And when matter and antimatter meet, they annihilate in a signature flash of energy. In this case, that signature is a gamma-ray with an energy of 0.511 megaelectron volts. 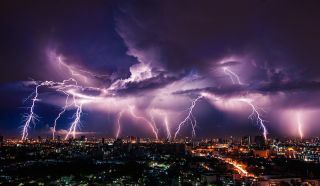 And that's what Enoto and his colleagues detected streaming down from a lightning storm, showing that a thunderhead is a giant, natural particle accelerator drifting through the sky.